For the 24 hours to 23:00 GMT, the USD rose 0.21% against the CAD and closed at 1.3109 on Friday, amid weak economic data. On the macro front, Canada’s consumer price index (CPI) climbed 2.2% on an annual basis in September, undershooting market consensus for a rise of 2.7%. In the previous month, the CPI had registered a gain of 2.8%. Additionally, the nation’s retail sales unexpectedly eased by 0.1% on a monthly basis in August, defying market expectation for an advance of 0.3%. In the preceding month, the retail sales recorded a revised increase of 0.2%. In the Asian session, at GMT0300, the pair is trading at 1.3102, with the USD trading 0.05% lower against the CAD from yesterday’s close. 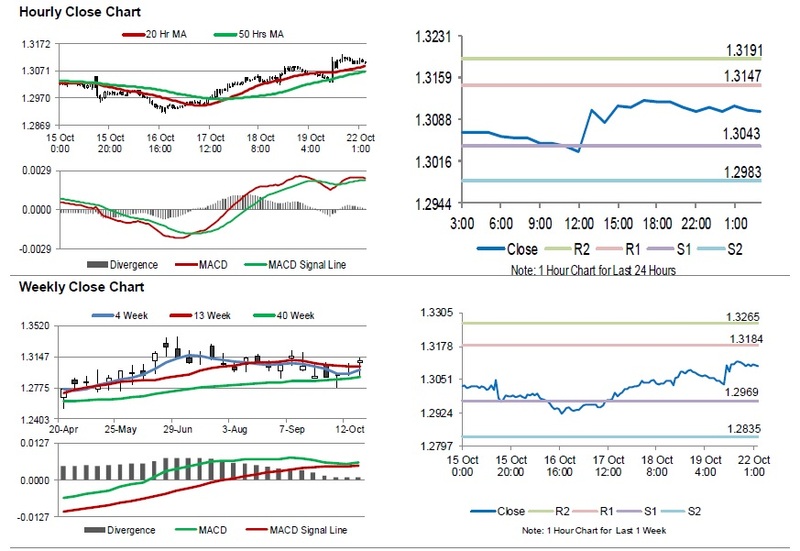 The pair is expected to find support at 1.3043, and a fall through could take it to the next support level of 1.2983. The pair is expected to find its first resistance at 1.3147, and a rise through could take it to the next resistance level of 1.3191.